The ideal football club owner, is a benign billionaire who works entirely for the benefit of the club for no monetary gain. They cherish the traditions of the club, appoint only the best of managers have the wisdom of Solomon i.e. know when to persevere with an under achieving coach and when to fire him. They give "football people" free reign to run the club even if their decisions seem contrary and cost many millions of pounds. They listen to the fans and respond to the clamor for a player or a scapegoat for failure with just that. They build magnificent stadiums and discount tickets to the point where every seat is full and then build an even greater palace of football. They only associate the club the most wholesome of sponsors (no tacky Money Lenders or On-Line Gaming companies need apply). At the end of his tenure which is laden with trophies he hands over the club to another equally benign billionaire. Meanwhile in the real world. 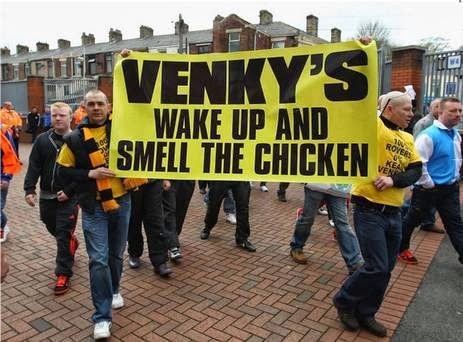 Owners are motivated by profit,ego, politics, occasionally love of the club but even those increasingly rare birds the "fan" chairman probably is not entirely there out of love. Personally I trust those who are there for the money. Their motives are easily understood and generally if they trying to make money from the venture they are not going to kill the club. Obviously if someone is wealthy enough to buy a club in the first place they are probably have just a bit of an ego, although there is a difference between a healthy self belief and rampant megalomania. The Americans owners are here because they think they can make money. Those that own Arsenal and Man United have, everybody else is nursing some pretty heavy losses. The notion that sports clubs can be profitable is pretty well established in the USA most NFL teams make their owners money. With the vast quantities of money from TV ,sponsors and other commercial ventures it should be possible to make money from running a Premier League football club. The only fly in the ointment is the prospect of relegation and an absence of any of the balancing mechanisms that make the NFL a competition and the Premier League a series of mini competitions depending on the clubs bankroll. Here is the rub because three clubs are always evicted from the rich man's club to the poor house of the Championship often with debts and overheads that cannot be sustained on the meager rations doled out through the parachute payments and much reduced income from other sources. To stay in the League most teams have to spend pretty much every penny they earn on wages and fees, which get bid up constantly and unless a steady stream of new recruits are arriving at a club fans lambaste the board for lacking ambition and coaches grumble about being down to the bare bones etc. However ultimately three teams will be relegated and then it is a question of what can be recovered from the financial wreckage. History is not kind to those that have over extended during their time in the Premier League saddled with debt's that no honest man could pay many limp on for decades in the twilight world of the championship selling their best players to make ends meet, never quite having the squad to regain entry to the Premier League. It does not have to stop in the Championship, Leeds, Southampton,Norwich City, Wolves Sheffield Wednesday, Sheffield United ,Portsmouth Bradford City Swindon Town Nottingham Forrest and Charlton have all experienced Premier League football and the delights of the third tier or lower. Only two have ever made it back to the hallowed halls of the Premier League. All this brings me to the the somewhat awkward position that West Bromwich Albion find themselves in and the uncomfortable relationship between the fans and the club's owner. There is a body of opinion within the fan base that unless an owner is behaving in the manner described in the opening paragraphs of this post will grumble about the owner being tight fisted and not investing enough in the team. When things are going badly they are joined by more reasonable fans who think that but for a little bit wisdom on the part of the ownership a couple of better players all would be well at the Hawthorns. I have no time for former but understand the latter. It is easy to be a Monday morning Quarterback and while some of the club's decisions can easily be questioned many were not entirely unreasonable at the time, obviously if you regard the club's ownership as the devil incarnate then you would never give them any benefit of the doubt or credit where it is due. All that said I think Peace's tenure has run it's course. There was a weariness in his summer interviews, it was if his skirmishes with the the FA & Premier League over youth development and FFP had finally convinced him that he was engaged in an uneven battle that he could not win. Ultimately Peace would probably like to sell up, but he will not sell for less than he thinks the club is worth. If Fulham were sold for £200m then realistically Albion must be worth at least £100m and there are not many people who can buy an asset which lest we forget barely makes a profit for that kind of money. Assuming a buyer can be found a new owner would still be faced with the fact that Albion have one of the lower incomes in the Premier League. Keeping the club in the league is a challenge. Whatever a new owner does it is unlikely even with a £90m additional investment over the course of say three years that we would be very much better than a mid-table team and the threat of relegation would not be removed, however the consequences of a relegation might be far worse than they are today. Peace might not be perfect but there are owners who are far worse, they may be prepared to bankroll a club for a short while but they demand changes that fans find unpalatable and when they walk away they leave problems that might take decades to sort out. too often club's get run in a manner that resembles a dysfunctional town hall because there is a constant need to respond to fan pressure. Those that shout loudest get the most attention in politics and unless the club's officers have some reasonable length of tenure democracy can kill a club almost as quickly as naked greed. Many fans criticise Peace but the plain fact is when he does sell up and move on the club will be in a better place than when he took it over. There are not many owners who could make that claim and I do fear the new boss will be the same as the old boss or something much worse, although there is always the possibility of the benign Billionaire rocking up at B71.